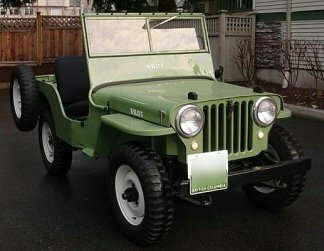 Rich Tolson bought s/n 211772 unrestored from a guy who used it for hunting and fishing who, in turn, had previously purchased it from a couple on a Yakima Washington. farm. 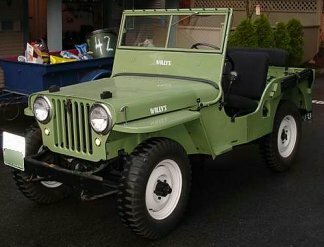 This CJ2A was originally painted Luzon Red, but Rich didn't care for it. The body color is really his own creation. It looks great! 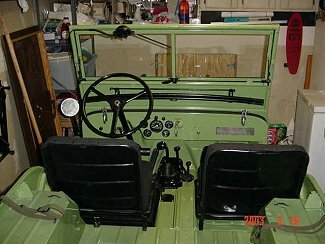 The seats are covered with black canvas, which he thinks will wear better with his kids climbing in and out. Rich says he still has a few things to take care of on the restoration, but it's coming along slowly but surely. One thing to notice is the storage of the top bow pieces. You can see the uprights stowed in the pockets on the side of the body. The crosspieces are in their proper place on the windshield frame.